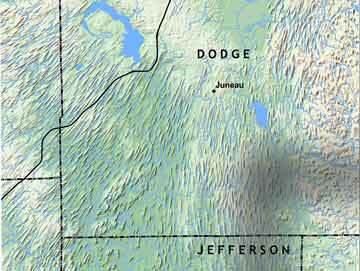 In the central to southeastern part of the state (particularly Dane, Dodge, and Jefferson Counties), well-developed landforms known as drumlins formed beneath the moving ice of the Green Bay Lobe, between about 20,000 and 15,000 years ago. The drumlins are generally teardrop-shaped hills that point in the direction of ice flow and fan out toward the outermost marginal ridge of the lobe. 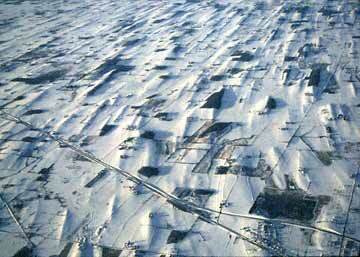 For the most part, drumlins throughout Wisconsin are composed of sand and gravel, which is sometimes mined and used in the highway construction and building industries. Poorly drained, low-lying areas between drumlins may be occupied by wetlands; some higher, drier areas may be covered by prairie. Many drumlins can also be seen in Rusk and Forest Counties. The State Capitol in Madison sits on a hill that is a drumlin.